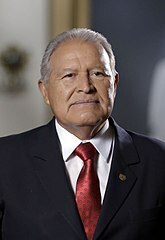 The President of El Salvador (Spanish: Presidente de El Salvador) officially known as the President of the Republic of El Salvador (Spanish: Presidente de la República de El Salvador) is the head of state of El Salvador. The office was created in the Constitution of 1841. From 1821 until 1841, the head of state of El Salvador was styled simply as Head of State (Jefe de Estado).